These lovely earrings from Carrie Elspeth are made from jewel like Czech glass in a semi-transparent shade of turquoise, like the sea on a cloudy day. The earrings can be worn for every day or a special occasion, perfect for enhancing a holiday outfit, to brighten an everyday outfit or wear on a special occasion. Combine with matching items to create a sophisticated look! Beautiful items of jewellery in their own right, these earrings are also designed to work with the matching necklace and bracelet to bring the whole set together. 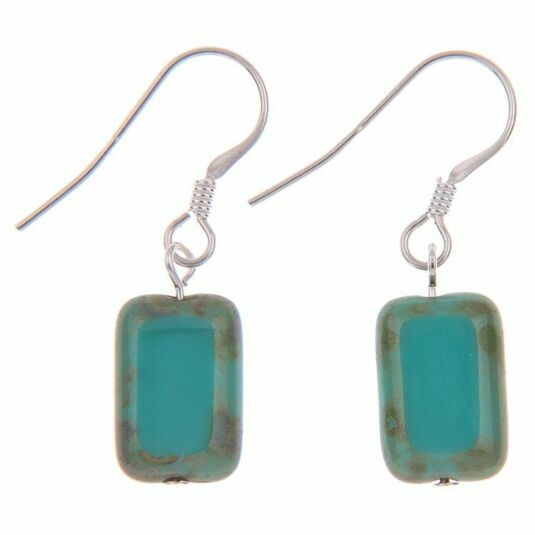 The lovely turquoise green of these earrings is very attractive, with edges enlivened by touches of bronze. Carrie Elspeth earrings always have sterling silver hooks for your comfort.